Moving Messages Boston Project Maps: Map of the Boston Foundations Catchment Area with a selection of 21 potential sites. Sites were chosen based on the size of the 'green space' / natural environments. 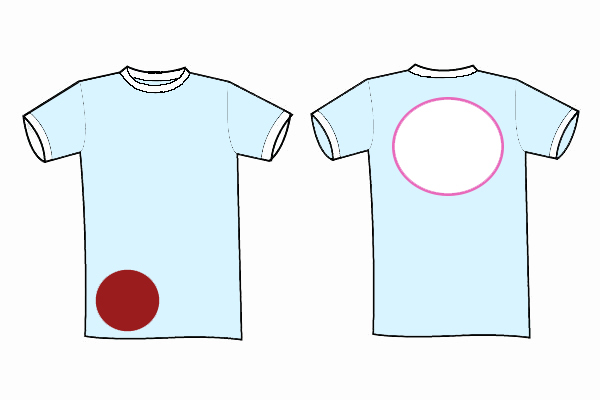 T-Shirt design example: Blank Spaces will be left in different parts of the shirt in order for participant to inscribe their messages with a fabric marker. I would like to make 150 different t-shirt designs based on the how the physical and social maps evolve. Social Maps: Below is a sketch for a social map which identifies social networks (individuals and organizations). The corresponding colors are intended to illustrate potential points of connection between different groups. They also designate where potential relays will occur geographically. The color within the inner circle corresponds to the place where the message will be delivered. For example: The light blue circle with the red dot corresponds with the red circle with the light blue dot. I was invited to develop a performance project for a donor tour organized by the MFA Boston. The tour sites included: The galleries at Montserrat College of Art, The Peabody Essex Museum, The Addison Gallery, and an artist’s apartment designed by David Ireland. Through questions, gentle prompts, and shared actions the day-long performance created a space for participants to challenge their assumptions about what art is and where to look for it. Challenging participants to question when their experience with “the art” began and ended, I used the transitions from one gallery to the next as the primary sites for my performance. The long bus rides between galleries were used as opportunities to engage the participants in discussions about a variety of social issues. Some questions that participants were asked to discuss included: Have you experienced gender discrimination this week? What role does white privilege play in white supremacy? Given the current social, environmental, and political climate what are the most urgent questions we should be asking ourselves as U.S. citizens? Participants wrote their reflections and their own questions on post it notes to display on the windows of the bus. I also handed out diagrams (sourced from the internet) that illustrated aspects of white supremacy and gender identification. While the bus was designated for workshop-type activities, I used our walks to galleries and the group lunch to create subtle images and improvised actions. My attire functioned as an image that developed over the course of the day. I wore a highly reflective jacket, space-printed pants, carried 70m of climbing rope, and occasionally used a megaphone during conversations. I wore a bio-metric sensing device and periodically reported my heart rate to the participants throughout the day. I modified stiletto high heals with climbing cord and micro-spikes used for icey-hiking. The heels required that I ask participants to physically assist me when walking on certain surfaces. The act of assisting me in walking (and entering into the image) was created to be ambiguous- was it part of “the art” or simply a practical request? Another example of an action that created this kind of tension was when I discreetly ate risotto with my hands during lunch at a local restaurant. RKSR+CNL is an ongoing art project with two distinct parts. The first invites the public to share experiences they feel are unique to contemporary life and creates a pictorial reference for them using the latest in tablet technology. The second part investigates tautology, interactivity and reflexivity, and the nature of signs through live actions and visual representation. The project was launched in January of 2012 with seed funding from the Berwick Research Institute and has been implemented in Boston, Oaxaca (Mexico), Disney World, and Chicago. Each Sketch has its own meaning. To see translations follow this link to the project page.